All government, in its essence, is a conspiracy against the superior man: its one permanent object is to oppress him and cripple him… The most dangerous man to any government is the man who is able to think things out for himself, without regard to the prevailing superstitions and taboos. Almost inevitably he comes to the conclusion that the government he lives under is dishonest, insane and intolerable, and so, if he is romantic, he tries to change it. And even if he is not romantic personally he is very apt to spread discontent among those who are. I felt shocked, outraged, and disgusted to read that the California American Legion voted to 1) deport all Japanese after the war, citizen or not, 2) Bar all Japanese descendants from citizenship!! We, who may have to give our lives in this great struggle—we’re fighting precisely to free the world of such Hitlerism, such narrow jingoism. If you deport Japanese, why not Germans, Italians, Rumanians, Hungarians, and Bulgarians? If you bar from citizenship descendants of Japanese, why not descendants of English? After all, we once fought with them too. America is great and strong as she is because we have so far been a haven to all oppressed. I felt sick at heart to read of this matter. I am writing also to the Los Angeles Times. For this thoughtful expression of his First Amendment rights, Pete Seeger ended up on an FBI watch-list; a place he would remain for the next thirty years. Following a Freedom of Information Act request, we now have access to his shocking 1,800 page file (well most of it, with the exception of 90 pages which are apparently still too embarrassing for public consumption). From the 1940s through the early 1970s, the US government spied on singer-songwriter Pete Seeger because of his political views and associations. According to documents in Seeger’s extensive FBI file—which runs to nearly 1,800 pages (with 90 pages withheld) and was obtained by Mother Jones under the Freedom of Information Act—the bureau’s initial interest in Seeger was triggered in 1943 after Seeger, as an Army private, wrote a letter protesting a proposal to deport all Japanese American citizens and residents when World War II ended. Seeger, a champion of folk music and progressive causes—and the writer, performer, or promoter of now-classic songs, including as “If I Had a Hammer,” “Where Have All the Flowers Gone?,” Turn! Turn! Turn!,” “Kisses Sweeter Than Wine,” “Goodnight, Irene,” and “This Land Is Your Land”—was a member of the Communist Party for several years in the 1940s, as he subsequently acknowledged. (He later said he should have left earlier.) His FBI file shows that Seeger, who died in early 2014, was for decades hounded by the FBI, which kept trying to tie him to the Communist Party, and the first investigation in the file illustrates the absurd excesses of the paranoid security establishment of that era. “Absurd excesses.” Kind of reminds me of another era. In July 1942, Seeger was drafted into the Army. (“I was almost glad when I heard from my draft board,” he later wrote in a diary.) He was assigned to be trained as an aviation mechanic at Keesler Field in Mississippi. While in the Army, he kept up with the news, and in the fall of 1942, Seeger, who was then 23 years old, wrote a letter of protest to the California chapter of the American Legion. Seeger had become a target merely because he had objected to mass deportations. The secret investigation coincided with the completion of Seeger’s training as an aviation mechanic. He expected to be deployed to active duty. But while he was under investigation, those orders never came. He watched the rest of his training class be sent to airfields, but he stayed put. At first, he wasn’t sure why. He was frustrated. The report concluded that Seeger was “an idealist whose devotion to radical ideologies is such as to make his loyalty to the United States under all circumstances questionable.” Seeger, this memo claimed, was “potentially subversive.” The document was sent to J. Edgar Hoover, the director of the FBI. Another military intelligence report concluded that Seeger’s “Communistic sypmpathies.…and his numerous Communist and otherwise undesirable friends” rendered him “unfit for a position of trust or reliability.” A third report said Seeger is “intensely loyal at this time. He is eager to join the battle actively against Fascism, and is applying himself to improve his military and technical knowledge to be of greatest service.” But it added that if the Communist Party line shifted against the war, Seeger could be susceptible to “potential subversion.” This report also focused on his love for Toshi Ohta: “While this relationship appears on a high plane, this Officer believes it to be unorthodox and one which might lead to divided loyalty in the event this country’s treatment of the Japanese were not in accord with the views of himself or the woman he expects to marry.” It went on to point out that “as an entertainer, his songs have been colored subtly toward idealistic classlessness.” And this memo concluded, “Despite [Seeger’s] intelligence and desire to apply himself to the destruction of the enemy, this officer believes that enemy to be Fascism and not necessarily any enemy of the United States.” That is, Seeger was more loyal to an abstraction than his country. The recommendation: that he remain under surveillance as a “potentially subversive” person. After the war, Seeger remained an FBI target. It was a time of communist hunting. Confidential informants had fingered Seeger as a party member or sympathizer, and throughout the 1950s the FBI generated hundreds of reports on Seeger. The bureau closely tracked his musical performances and his appearances at political events. It monitored his associations with groups and persons suspected of being linked to or controlled by the Communist Party. FBI agents called his booking agency and pretended to be people who wanted to arrange a Seeger performance in order to collect information on his travels within the United States and overseas. The burgeoning folk music world overlapped with the progressive movement (which the bureau saw as riddled with and dominated by commies) and Seeger was at the nexus. The congressmen running the commie-hunting committee were not pleased. In 1957, Seeger was cited for contempt of Congress for not answering the questions about his political associations. Four years later, after much legal wrangling, he was found guilty after a three-day trial. Seeger was sentenced to a year in prison. He remained free on bail, and a year later, the conviction was overturned when a federal appeals court determined the original indictment had been defective. After that, the Justice Department dropped the case. So the legal system set him free, yet the intelligence establishment did the following. Seeger’s FBI files indicate the FBI actively monitored the contempt case against Seeger. Its agents stayed in contact with the prosecutors handling the case, as the bureau kept gathering information on Seeger’s connections to progressive organizations—civil liberties and civil rights outfits, peace groups, pro-labor entities, and the like—that it deemed subversive. It closely watched his use of his passport. After the contempt case concluded, the FBI remained on the Seeger beat. When the folk singer traveled abroad, according to a 1963 FBI note from Hoover to the State Department, the bureau notified the CIA and asked for any information it might obtain on Seeger overseas. At one point, when Seeger played a series of concerts in Hawaii in 1963, the FBI collected information on the shows, noting that an audience member from an “avowedly anti-Communist organization” had reported to the bureau that Seeger had sung a song that was “low keyed propaganda to the effect that America is a land of conformity” and also played a song from Japan about nuclear bombs. FBI surveillance of Seeger continued into the early 1970s. A 1971 FBI report listing evidence of his “CP Sympathy” noted that Seeger had entertained at a benefit concert for three soldiers who had refused to serve in Vietnam because they believed the war there was illegal, immoral, and unjust. Also, it pointed out that he had raised money at a Los Angeles concert for a group called Southern Californians to Abolish the House Committee for Un-American Activities. A 1972 FBI memo reported that Seeger “has manifested a revolutionary ideology.” The message: He still needed watching. Of course, none of this should be the least bit surprising to anyone who has followed the FBI throughout its history, including modern day witch-hunts, such as the targeting of late internet prodigy Aaron Swartz. 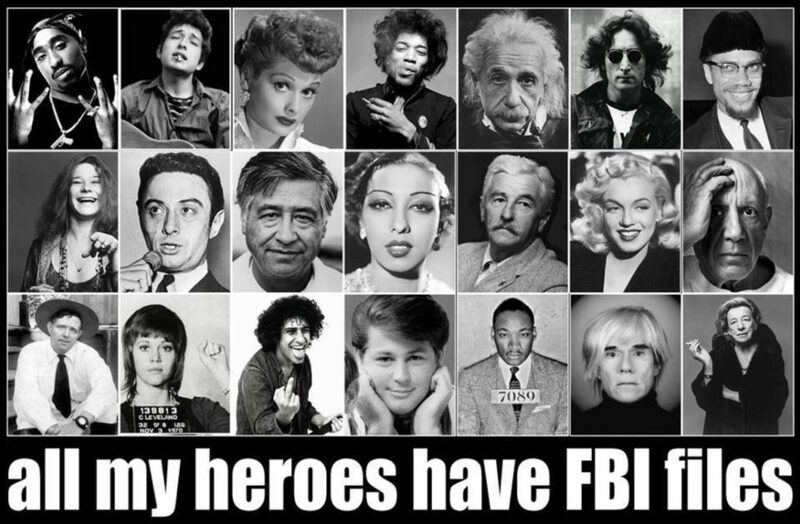 Importantly, the FBI isn’t always on the wrong side of history by accident, it is a reflection of the fact that the organization is little more than an enforcement arm of the status quo, as opposed to a protector of the people.